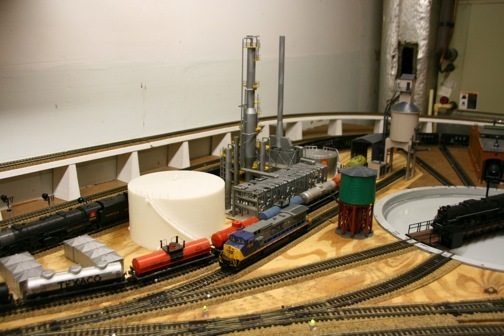 As I mentioned in the page on Train Brain, my good friend Bob Fahrney has an HO scale model railroad layout, which I had the pleasure of visiting twice recently. 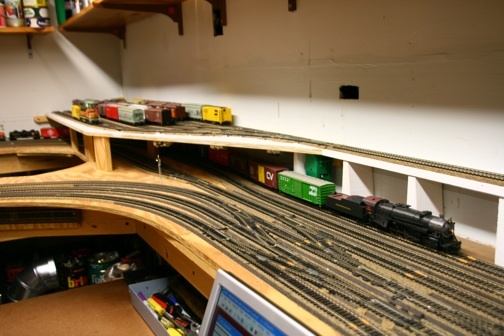 He started his railroad by first blocking off about ¼ of his 2-car garage. Amazingly, he can still get both cars in without difficulty. 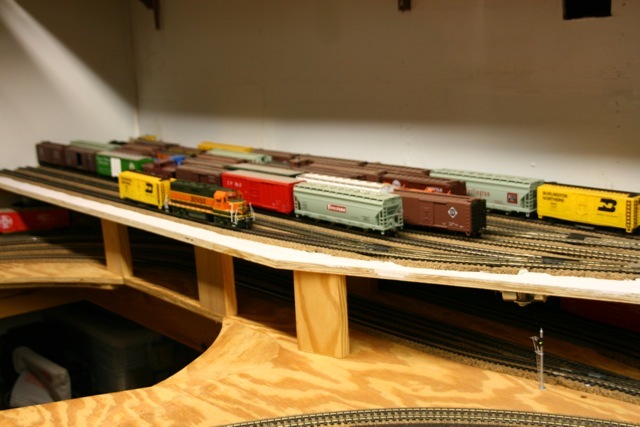 He put up a sliding wooden door as an entrance to his layout room. Since it is closed off from the rest of the garage, it is protected from outside dust and weather. His benchwork is wood bracing topped with plywood. 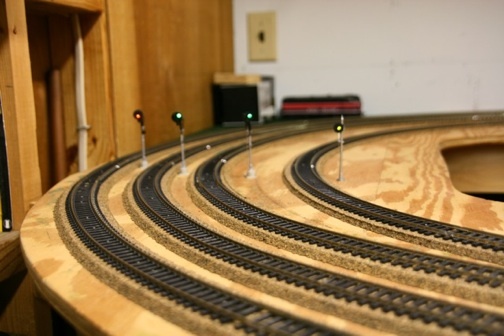 He has 2 access areas to make it easy to get to the outer loops on each side of his layout. He started his track-laying with one mainline dogbone. After this was done, he wanted to add more trackage to make it more interesting. 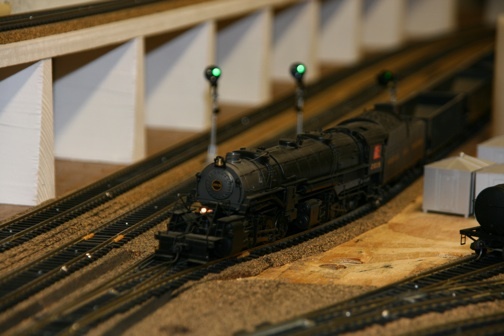 So over the years, his layout has developed into a 3-line model railroad layout with turnouts arranged such that he can move any of his trains from one line to another. 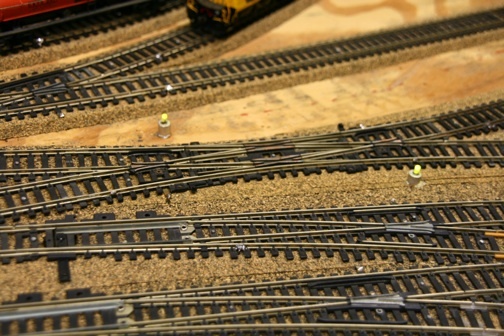 His junctions are located in the center of the layout. 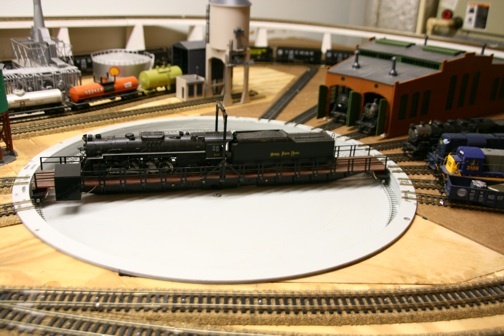 He also has a large turntable big enough for the largest articulated HO engine made (the “Big Boy”). Turntable control is carried out with a rotary switch and a special motor that stops in just the right places to line up with the tracks on the edge. 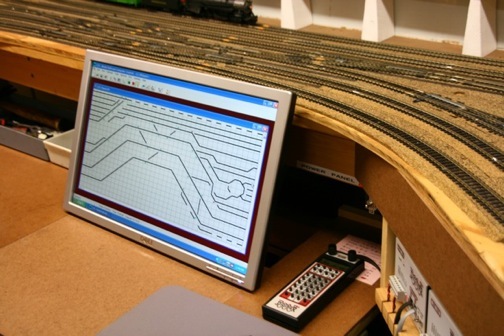 •	You can get your train from any point on the layout to any other point despite having three mainlines. 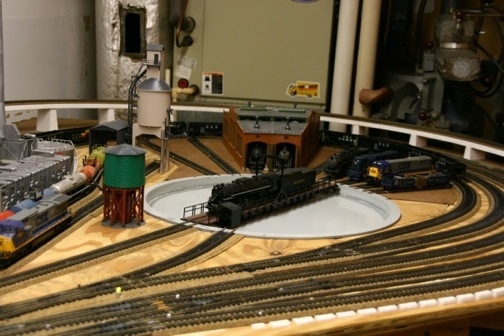 •	Any of the trains can access the turntable. •	It has 2 layers with only a small % grade from the bottom layer to the top, where he has a staging yard. •	It is DCC and computer controlled. •	He has an excellent operating signal system. 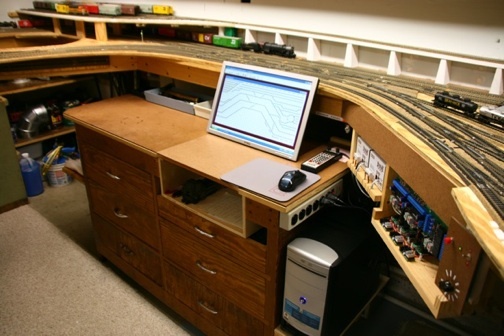 •	His trains run smoothly and flawlessly and can even start and run at very slow speeds very much like the prototypes. •	He has sound decoders installed in each of his locomotives. •	There are 2 reversing loops that are controlled automatically by the Digitrax controller. 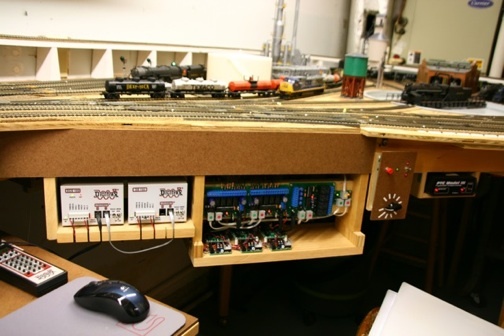 So, with operating signals, computer and DCC control, very realistic sounds emanating from smoothly operating locomotives, excellent ability to navigate to anywhere on the layout from anywhere else and 2 reversing loops controlled electronically by the Digitrax system, he has a fantastic operating layout. He readily admits, he doesn’t like to do much scenery, because he likes to change his trackage and turnouts periodically and having scenery in the way would make this difficult. Nonetheless, he has done a marvelous job at creating a well-designed, electronically up-to-date, smoothly operating model railroad layout that I immensely enjoyed visiting. From "Bob's Model Railroad Layout" to "HomePage"
From "Bob's Model Railroad Layout" to "Train Brain"